Makroman, a village in Samarinda municipality - the capital of East Kalimantan province - is encircled by mines. For the past five years coal mining operations have been excavating the land around Makroman. This is something that worries Sugianto, a transmigrant farmer from Java, Indonesia's most densely populated island. The morning we spoke to him, Sugianto had just finished planting the last section of his rice paddy. His face was rolling with sweat and his clothes were covered in mud, as he stood ankle-deep in the paddy field. "This rice field has provided a living for three generations, but coal...once it's gone, it's cut and run", he says, annoyed. "My grandfather, my father and now I live from the paddy fields, and in future, so will my children", he says. Sugianto's family moved to Makroman around 1975 as part of the transmigration programme. At the time he was just a baby. Now Sugianto is thirty-five and has married a Kenyah Dayak woman. Their eldest child is in the third year of primary school. The family mainly harvests rice and other crops from their small plantation. "But my plantation is bankrupt. I had hundreds of rambutan and durian trees, but they died after being repeatedly swamped by mud from the coal mine, since CV Arjuna started extracting coal," he says angrily. He used to earn Rp12 million from one fruit harvest. Today, only a few trees which escaped the mud can still be harvested. Sugianto's family has 3 hectares of rice fields and some rubber trees. But the paddy fields, which can produce 5 tonnes per season, are under threat too. In January 2010, the fields, which are only a few hundred metres from the open-cast mine, were inundated with mud. The harvest failed. Sugianto was not the only one: his neighbours were affected too. One neighbour, Sulistianingsih, aged 36, remembers being swamped by coal mud. "This was the first flood the whole time I've been living here. It started when they began mining coal in the hills up there," she says. Sulis is a poultry farmer. She and her husband have different roles: he manages the fish ponds while she looks after the chickens. More than a hundred chickens were killed in the flood. "It rained all day and then at night our house was hit by the mud. The fishpond vanished, buried in mud and the fish were killed," she adds. Sulis' family have several fishponds where they raise freshwater catfish, mujair, goldfish and nila. The same thing has happened to Nurbaety, 67, a white-haired mother of ten, whose youngest is now in the sixth year of primary school. "My house has been hit by mud floods many times. You can tell from the damaged walls," she says. Nur's house is very close to the mine and she is the first one to be hit when the floods come. Her paddy fields too, have been swamped by mud. It seems that when it rains heavily all day, it is too much for the poorly constructed containment ponds that are supposed to cope with mine waste. The ponds consist of four linked sections measuring 2 by 3 metres, whose channels contain ijuk or palm fibres, which are meant to catch the sediment. Clearly this waste management method is irresponsible and dangerous. "In the end we protested at the CV Arjuna mine site, demanding a stop to operations so there would be no more floods", said Nur. Around 70 families in two groups - fisherfolk and farmers - held repeated protests and forced the company to halt mining operations. They demanded that the company leave the area. The company didn't know how to react and neither did the provincial and district government officials. The head of the mining service stepped in. The people demanded compensation for around 50 hectares of paddy fields and fishponds that had been swamped by mud. They succeeded and the company paid Rp10 million for each hectare affected. Unfortunately, the resolution of this case brought more dangers. 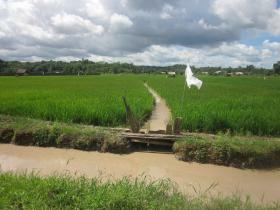 Four months after the flood, the company agreed to widen the irrigation ditches feeding the paddy fields. They also bought up some of the villagers' rice fields saying they needed the land to build reservoirs to prevent future flooding. Recently local people have learned that the company has dug new channels and is channelling waste directly into the newly widened irrigation ditches. Today the water in the paddy channels is a milky coffee colour, containing brownish-black sediment from the mine. These ditches serve as a source of water for people's livestock and fish as well as for the rice fields. "My fish are no longer feeding and have grown weak because of the cloudy water. I used to get Rp 1.5 million a week from the fishpond," said Wagiman, who leads the fisherfolk group. This area's water comes from the rivers flowing down from the mountains and from springs trickling out of the thickly forested hills. Near the edges of the forest, it's easy to find sources of water near the paddy fields. Small wells of about half a metre, filled with clear water, are dug by farmers near their field huts. These huts are used by farmers as a place to eat and to take shelter during their work in the paddies, as well as for storing tools. But since the rivers have been blocked off, and their lower reaches dredged for coal, they can no longer provide clean water. The springs are also threatened as mining takes over more areas, levelling the forests - and the hills themselves - to the ground. CV Arjuna has a mining permit covering 695.5 hectares. Currently there are two large, gaping pits almost 100 metres deep, which have now turned into large green-coloured lakes. There has been no effort to rehabilitate the area, or even just grow trees on it. There are no warning signs indicating that the area is dangerous and should not be entered: no security fences; no public notices. Instead local traffic crosses the area unrestricted. The situation in the mine site is worse. Several hills have been stripped of their forests and abandoned as they don't contain any viable coal deposits. In active mining locations, the excavation is done at random. Waste rocks are piled up all over the place, rivers are blocked off, hills are levelled to the ground. Water from the mining pits is pumped into the inadequate containment ponds, carrying the waste downstream straight towards the local villagers' paddy fields. There clearly isn't any point in widening the irrigation ditches: in the space of just one month the ditches are half-filled with mud from the mine. The villagers predict the dry season will be even harder - a water crisis is on the way. In early January this year, some people had to plant their rice on dry land - using sticks to make holes for the seed in a method called mendugal - because there was not enough water. The once fertile land is becoming hard to plant. The villagers had to choose between using water pumps, or leaving their fields unplanted. Using pumps adds to the costs of farming, already high enough as government subsidies have been cut. As a result, the farmers face the threat of not being able to grow their own food. Makroman used to be well-known as a fertile transmigration site, for growing rice and producing fish. The fields were opened in the 1980s and the site's fertile land and plentiful water attracted transmigrants from other areas too. But since the rising global demand for coal and the government's eagerness to hand out mining licences, Makroman has become encircled by mines. Two companies operate these mines: CV Arjuna and PT CEM (Cahaya Energi Mandiri). CV Arjuna's permit covers 695.5 hectares while PT CEM covers 680.8 hectares. "I don't know why we're surrounded by coal mines - even our paddy fields are included in mining concessions. We don't know where the boundaries are. If those hills are destroyed, we'll be finished", says Sugianto, pointing to two hills very close to the area currently being mined. The noise of the vehicles and machines at the mine can be heard clearly from Sugianto's paddy field. This portrait of Makroman and Sugianto's story, are typical of East Kalimantan today. It is as if people there are stateless, with no government to protect them. As if driven by profit alone, government officials in this province are issuing coal mining permits like there's no tomorrow. The number of permits has reached 1,269. Samarinda is the area with the second highest number of permits issued - 76 permits - after Kutai Kertanegara district. The daily newspaper Kompas has reported that every year, 12,000 hectares of farmland is being taken over by mining. In Kutai Kertanegara district there are now 749 mining permits. Compare this to the number of villages in the district and it means there is almost one permit per village. The authorities are issuing them at a rate as high as one every two days. East Kalimantan has more coal than anywhere else in Indonesia and, it seems, every inch of the land is being dug up to get at it. The great coal rush has brought anything but prosperity for ordinary people: it is as if Kalimantan is cursed. Its rich energy resources, exploited by greedy officials, have brought misery to the people who live there. They endure sustained electricity crises, floods, and inter-community conflict due to land use changes and overlapping claims. In another few years, East Kalimantan will face a serious water and food crisis. But these crises brought about by coal mining and the accompanying corruption in Kalimantan - which holds one of world's biggest coal reserves - do not feature in global politics. They aren't on the agenda for discussions about climate change - at local, national or international level, even though coal, along with oil and gas, is the biggest contributors to global warming and mining is an industry which consumes huge amounts of energy itself. Instead, the demand for coal from China, India, Japan and Europe keeps rising steadily. If climate change is a global problem, where is the global morality and responsibility of these countries towards Makroman and Kalimantan?